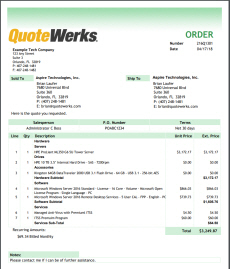 QuoteWerks serves over 85,000 users worldwide in a variety of of industries, such as analytical instrumentation, A-V design and installation, IT, manufacturing, commercial aviation maintenance, display and exhibition, machinery distribution, non-profits, telecommunications and more. 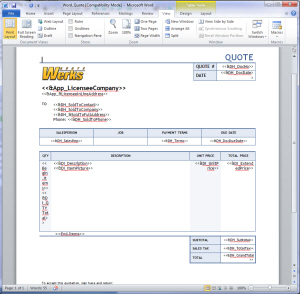 Each industry has different formatting standards and requirements for the contents of the quote that is presented to their customer. 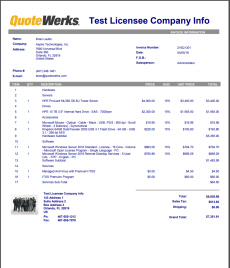 With the QuoteWerks layout designer you have a lot of control over the look and feel of the document you present to your customer. Presenting your customer with professional looking standardized quotes and proposals goes a long way towards promoting your company image and brand. 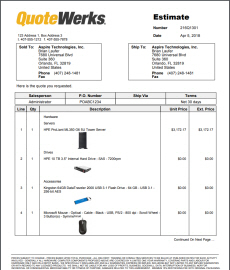 Utilizing QuoteWerks, companies can have branded, standard company layouts for all of their quotes, proposals, orders, invoices, and purchase orders. Furthermore, security settings can be placed on individual users to ensure that they only use specific layouts and are unable to make changes or delete them. 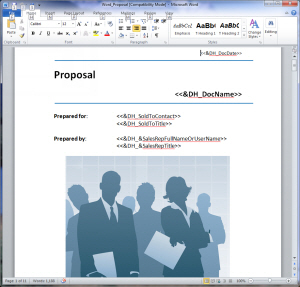 Users can only send the company approved layouts, preserving the company's image. 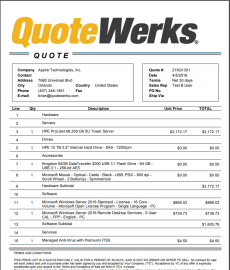 QuoteWerks layouts are designed to be easily customizable with company logos, different color schemes, as well as a variety of fonts. 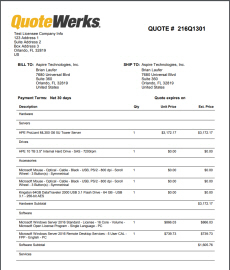 The layouts can also be customized to display or hide numerous fields from QuoteWerks. Users can choose to show line item pricing in groups or single items or hide them completely. Layouts can also be edited to include manufacturer, manufacturer part number, vendor, vendor part number, and many more. 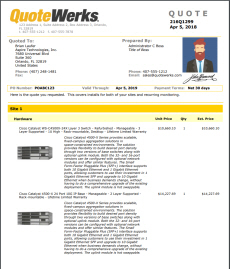 The layouts are an essential component of every quote because the information displayed in the layout is what your customer or prospect will see. Additional sample layouts are available for download below. 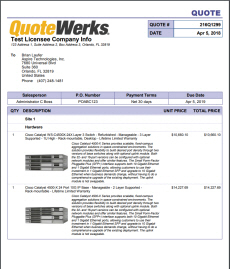 We include several sample layouts in a default installation of QuoteWerks. As you can see below, there are many different possible layout design permutations. You can download the free sample layouts below that can be customized for your business and industry. 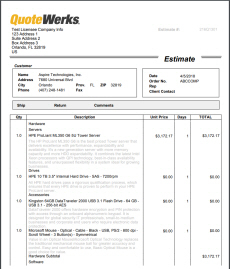 All of the samples include the Aspire and QuoteWerks logos as examples. You can, of course, remove them entirely, replace them, and/or add additional logos and pictures. 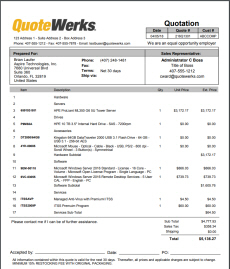 To download, right-click and save the FPC file to your ..\QuoteWerks\Layouts folder. If you have questions, please feel free to contact your sales rep or technical support. 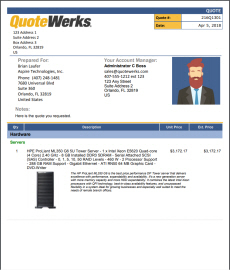 Starting with QuoteWerks Version 4.6, QuoteWerks users now have the ability to create Quote Layouts in Microsoft Word in addition to the built-in QuoteWerks Layout designer. You can download the free sample layouts below that can be customized for your business and industry. 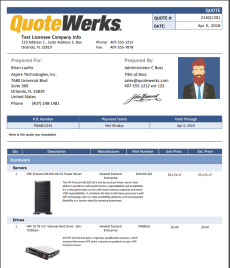 All of the samples include the Aspire and QuoteWerks logos as examples. You can, of course, remove them entirely, replace them, and/or add additional logos and pictures. 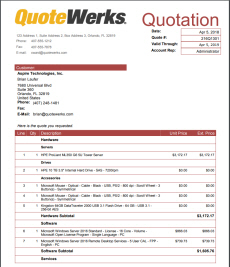 To download, right-click and save the DOC file to your ..\QuoteWerks\Layouts\Quote folder. 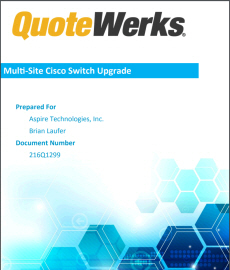 If you have questions, please feel free to contact your sales rep or technical support. 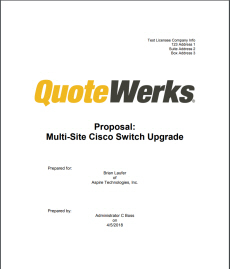 Note: You will need to configure your items in QuoteWerks to work with this Proposal. If you need assistance, we offer Professional Services.